nor the one in western sky drawing down evening sun. beside crinkled missives no longer requisite. until it soars, he prays someday she will believe. Today I play with first lines. 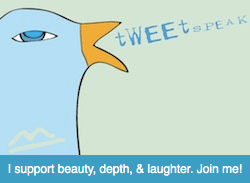 At Every Day Poems the lovely people at Tweetspeak Poetry offer a challenge. Sign up to receive a poem in your in-box each morning. Find a line that sings to you and use it as the first line of a poem of your own design. My inspiration this day comes from The Robot Scientist’s Daughter by Jeannine Hall Gailey. This entry was posted in Every Day Poems, Poetry, Tweetspeak Poetry and tagged birds, Every Day Poems, Jeannine Hall Gailey, litany, pray, robots, The Robot Scientist's Daughter, Tweetspeak Poetry. Bookmark the permalink.